G‑d forgives, but says that the effect of their sin will be felt for many generations. At first G‑d proposes to send His angel along with them, but Moses insists that G‑d Himself accompany His people to the promised land. Moses prepares a new set of tablets and once more ascends the mountain, where G‑d reinscribes the covenant on these second tablets. On the mountain, Moses is also granted a vision of the divine thirteen attributes of mercy. So radiant is Moses’ face upon his return, that he must cover it with a veil, which he removes only to speak with G‑d and to teach His laws to the people. Calf Worship Chronology What day does your chronology say? Your questions seem to represent that you already have your answer in your head. Moses was not commanded to kill anyone. In fact it was the L'RD that was declared He would 'My wrath may wax hot against them, and that I may consume them, and with Moses, make a greater nation than these people. To start over with Moses, indicates that only One is needed at fulfill the remnant promise. Moses ignored the L'RD's Comment and used logic to defend the Hebrews. 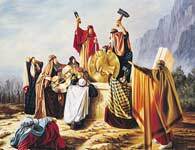 But upon seeing for himself, Moses then defends the L'RD by slaying the Idol Worshipers, which broke the first two Commandments. To Anonymous in SLC The 3,000 people killed were the ones that actually worshiped the golden calf. These did not include children. the commandments and Moses i like these comments on sin and Moses disagreements and G-d's abiiity to discuss and change his mind . Very Interesting, But . . . . Answers: Exodus 20 Second Law. Moses was being tested like a 2014 CEO who has finds out that his company is making clothing in a sweat house in Indonesia using children, 'Don't look and you will make millions of dollars and no one will be the wiser'. Many people accept deals like that, but Moses ignores the offer and uses God's Glory as a tool. Remember Moses' job was only to bring the Hebrews to this mountain. We need to trust Moses and his integrity. Remove my name . . . ." Moses is not refusing to worship God, he is trying to defend those still alive that broke Second Law. From this we learn that no one stands between you and God's judgment. A closer review is where we learn that there is a book of life, for only those that sin against God will surely die. Oy! Our friend in Puerto Rico does not understand that Hashem is NOT a bully as he suggested. Hashem gives us what we need, even when we don't believe in him, he believes in us. There is no place, I think, in Chumash prior to the 10 commandments where we were told not to make idols, however, they messed up by not trusting that Moses would come down. There still exists today people who would put other gods before them, a major boo-boo in anyone's book. IMHO, methinks that the real reason behind Hashem's anger was against the evil ones who proposed the idol, not the idol itself. He has a way of getting rid of evil people. Re Anonymous comment that Moses is awesome, yes he was our greatest ever!